Powered by the next generation Intel Celeron processor. Anti-Glare solution helps reduce eye strain and provide a better viewing experience. Fan-less design reduce noise caused by fan running and improve PCs reliability by reducing dust in the system. 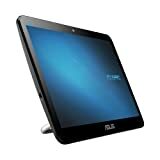 15.6″ LED 10-point touch screen for better touch experience. Built-in USB 3.0 ports, COM ports, HDMI-out port, and VGA-out port allows versatile application. This entry was posted in Desktop Computers and tagged 15.6inch, A4110BD027M, AllinOne, ASUS, DDR3, Desktop, Intel, N3050 by Computer Education World. Bookmark the permalink.